Tribeca’s Washington Market Park got some unusual visitors last week. One could lose its tail and grow it back. Another came equipped with four rows of teeth to help gobble down its big furry meals. And yet another could live for a couple of centuries. 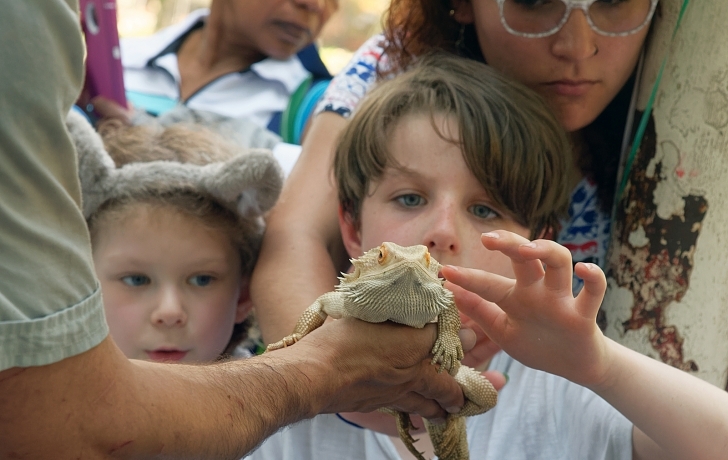 To the delight of some 200 kids and caregivers, those creatures (leopard gecko, boa constrictor and alligator snapping turtle) were just part of Leonard Billé, Jr.’s traveling reptile company called The Teaching Turtle. The afternoon program, a first for the park, was sponsored by Friends of Washington Market Park. Standing in the park’s gazebo and speaking over a cacophony of excited chatter, Billé, whose day job is zookeeper and educator at the Bronx Zoo, provided a litany of fascinating facts about each of his six scaly companions. Then he showed them around (except for the snapping turtle) for all to touch. On the ground, two species of tortoise (the redcoat and sulcate) crawled about their pens, providing children with an up-close view, and a chance to pet their shells. “What do you like to eat?” Billé asked as he went from one child to the next with his black-and-white South American tegu. Actually, the children learned as they called out their favorite foods, the tegu, which will grow to four feet, will eat anything they do, and considerably more. The animals that Billé, 32, introduced that afternoon were just a small sampling of the menagerie he has been keeping and breeding in his parents basement in Haverstraw, NY, since he began his collection at age eight. (“They have been very understanding of my passion for reptiles,” he noted.) Now, through The Teaching Turtle, he wants to give children the same zeal and appreciation for the animals that he’s had for most of his life. Understanding an animal, he said, helps children lose their fear of it.